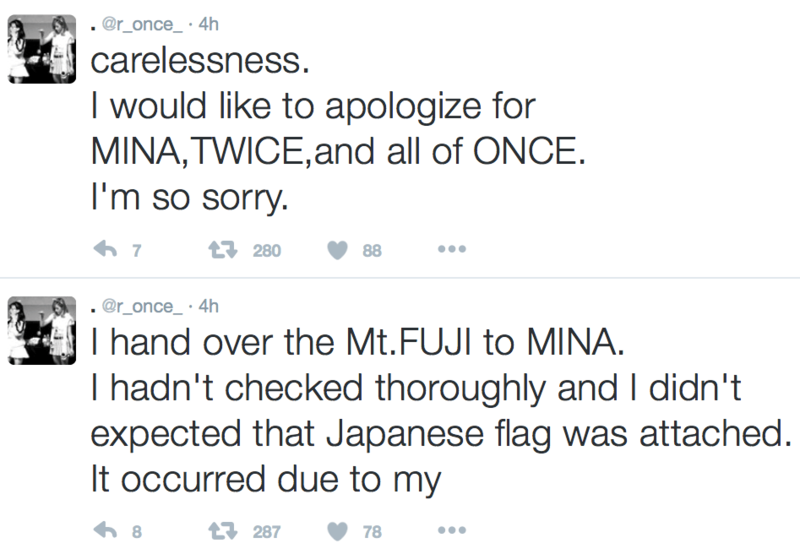 Mina of TWICE has been embroiled in yet another flag scandal yesterday during a fan meet, this time involving the Japanese Rising Sun flag. As can be seen in the video below, a fan hands Mina a Mt. Fuji hat face down as he moves on to next chair. Mina puts the hat on her head without checking the front, where words “Japan is No.1” are imposed over a Rising Sun flag and the tag picturing the Rising Sun flag still hangs. The Rising Sun flag was the flag used by the Imperial Japanese military during World War II. The flag generally has a negative connotation in South Korea and China due to war crimes that were committed under the flag during the war. Luckily, a manager sees the tag on the hat and rushes forward to remove the hat from Mina before a minute even passes, and he shows Mina the tag on the hat in explanation for why he removed it. You can check out the video below and two photos a fan managed to capture before the manager took the hat away. The fan who gave the gift tweeted first in English apologizing for the mistake, then deleted the tweets and apologized again in his native language, Japanese. You can see both the English tweets and the Japanese tweet below. This is not the first time Twice has been tangled in a flag related incident; member Tzuyu was also given heat for holding a Taiwanese flag back in January, causing tensions amongst the Chinese fans. This is not the only instance of an idol wearing this Mt. Fuji hat, as VIXX members N and Ravi were also seen wearing it in their show, VIXX TV. 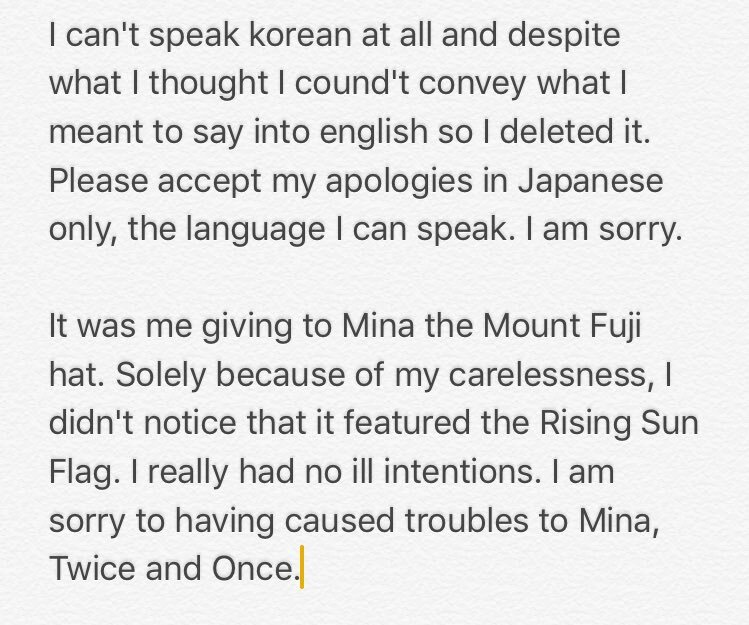 The boys of VIXX publicly apologized for showing the Rising Sun Flag soon after the incident. It’s clear from the video above that Mina did not see either symbol on the hat and wore it to be polite to her fan, so hopefully this all blows over soon. Keep reading moonROK for updates on this story and all your other favorite Kpop artists!